OK, we here at thefanboyseo.com will never trade the taste and caliber of San Miguel Pale Pilsen and Red Horse beer but its good to try out different beers from time to time like this Mortal Kombat X beer. 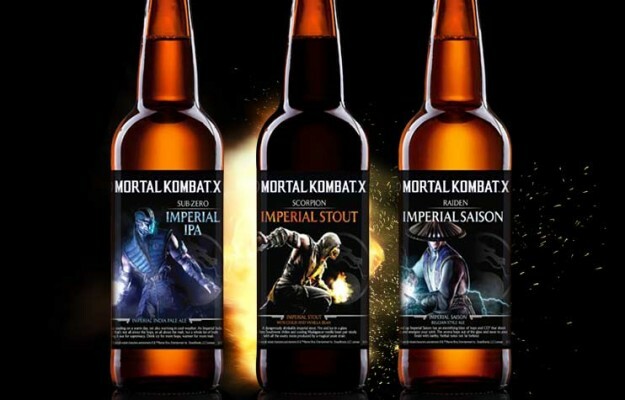 The Mortal Kombat X beer is currently available abroad (I already asked) but there’s a high probability that you can import one down the line; just not now. The beer is manufactured by Washington’s Sound Brewery in cooperation with Warner Bros.
Sub-Zero Imperial IPA: Refreshingly cooling on a warm day, an Imperial India Pale Ale that’s not all about the hops or the malt but is a whole lot of both fighting it out for your palate’s supremacy. Drink icy for more of the hops or warmer for more malt. Raiden Imperial Saison: This amped up Imperial Saison has a blast of hops and CO2 that will hit your tongue with a bang. The aroma jumps out of the glass with its earthly and herbal notes not far behind. Scorpion Imperial Stout: A unique blend for great Imperial Stout brings both fire and ice into your glass. The fiery southwest chilies and cooling Madagascar Vanilla Bean pair nicely with the exotic notes produced by our own yeast strain. Global Beverage Traders will distribute the brew. Also interestingly enough, you get more context when somebody tells you to “Finish Him” when there’s still some drops left for you to finish. Converse The Dark Knight Returns Sneakers Announced!